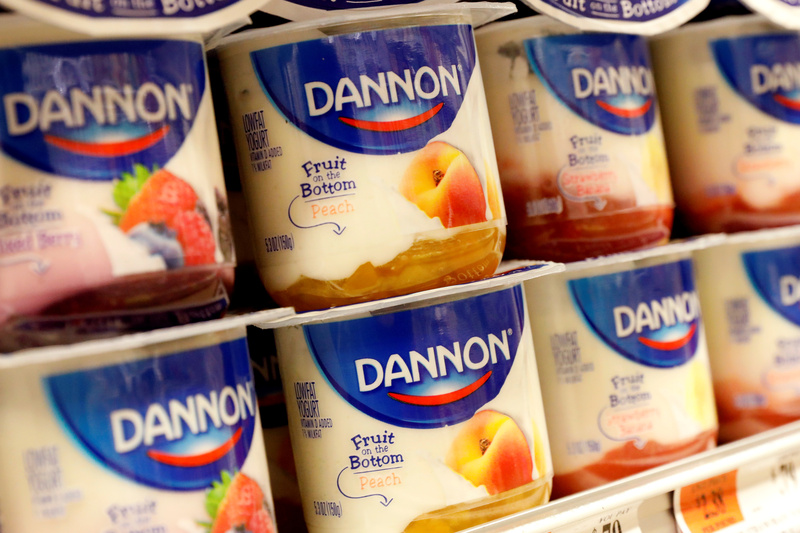 Containers of Danone's Dannon Yogurt are displayed in a supermarket in New York City, U.S., February 15, 2017. French yogurt maker Danone said on April 17 that like-for-like sales rose 0.8 percent from a year earlier to 6.1 billion euros in the quarter ending March 31, broadly in line with analyst expectations. The sales volumes in its dairy and plant product unit fell 3.8 percent and specialised nutrition volume declined 0.9 percent, while water volume rose 1 percent compared to the first quarter of 2018. The 48 billion euro company said it expects revenue growth to accelerate from the second quarter and confirmed its guidance of 3 percent like-for-like sales growth for the full year 2019. Danone shares fell around 2 percent to 68.28 euros at 0857 GMT on April 17.